This morning we made our plan to scoot straight across to Algonquin Provincial Park in Ontario from Plaisance, Quebec. We drove across the Ottawa River and right through the city of Ottawa, we had our sights set on the fall colours of Algonquin (as did many others)!! We had quite some distance to drive and therefore plenty of time to plan our activities in the park. We had even chosen our preferred campground which would be suitable for launching the satellite allowing us to work. Everything was set - so now we just had to get there. 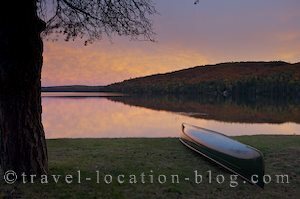 One thing that always catches us off guard while travelling in Canada are the school holidays or long weekends, and when we arrived at Algonquin the place was bursting at the seams with families enjoying the last days of summer. Besides the families, there were bus loads of tourists - I mean bus load after bus load. Our first concern was to find a campground for the night, which was no small feat. Our preselected campground turned out to be closed for the season so we tried the next ... it was full! After trying a few others which were either closed or full, we turned around and back tracked to near the entrance of the park and tried at the Rock Lake campground. Luckily they had a few sites left, although they would not be open enough to launch to the satellite dish, but we had no choice so took one of them. The other problem with the remaining sites was that they were far from level - even with the blocks we weren't able to get the camper level - all this for a steep price!! Once we were finally set up on the site as best we could - we reformulated our plan. We found out from the office which sites were possibly becoming available tomorrow and took a look at them to pick out one we thought would suit us best. Unfortunately, a site cannot be booked until after 12noon on the day of arrival, thus allowing the current occupiers the option to extend their stay if they choose. So we would hang out until 12noon the following day - ready to pounce on our chosen site. After organising dinner we decided to take the canoe down from the camper and walk with it over to the waters edge. The site we have chosen for tomorrow (which hopefully we get) is right next to the water which will be great for heading out in the canoe - very easy access! We were finally able to sit down and appreciate the scenery, the fall colours, and watch the sunset. Nothing so far that day had turned out quite as planned, but now that we were here we were going to enjoy it to the full!